The Rolling Stones performing in Berlin in 1965. 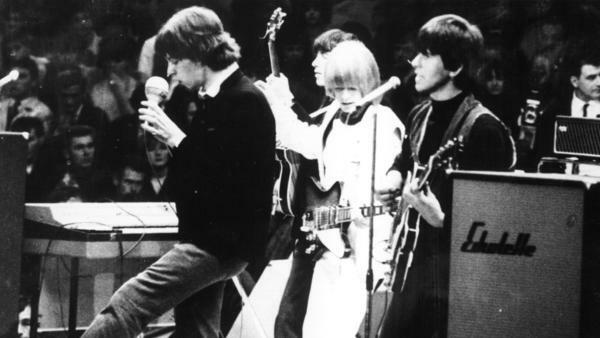 The band's 1965 hit "(I Can't Get No) Satisfaction" made heavy use of Glenn Snoddy's fuzz tone. Rock and roll music isn't supposed to be pretty. It has grit and grime; fuzz and feedback. It's dirty and imperfect. Much of that characteristic sound came from the accidental invention of the Maestro Fuzz-Tone FZ-1. The fuzzy tone, immortalized in The Rolling Stones' "(I Can't Get No) Satisfaction," came from a guitar effects box invented by Nashville studio engineer Glenn Snoddy, who died May 21. Like so many great innovations, fuzz tone came about from a happy accident. In 1960 in a Nashville studio called the Quonset Hut, Snoddy was working with country singer Marty Robbins on the song, "Don't Worry." There was a bad transformer in the console and when it was time for the instrumental solo, the guitar issued a decidedly odd sound. Snoddy was initially annoyed by the faulty equipment, but was convinced by the artist and producer not to re-record the session: It was a delightfully novel sound. By 1961, "Don't Worry" was topping the country charts and guitarists wanted to know how to get the fuzz. Nancy Sinatra went to Snoddy asking for his secret, but the magic transformer had died, so he invented a box with a button for guitarists to activate the fuzz-tone. Gibson started manufacturing the FZ-1 and soon other companies joined in the fuzz frenzy, marketing boxes with names like Tube Screamer, Big Muff and Fuzzrite. The fuzz revolution led to songs like "The 2,000 Pound Bee" from The Ventures, "In-A-Gadda-Da-Vida" from Iron Butterfly, The Guess Who's "American Woman" and on and on. Though Snoddy died in Murfreesboro, Tenn. at the age of 96, his legacy lives on through this unintentional invention that helped change a genre. Let's take a moment now to remember the inventor of the Maestro Fuzz-Tone FZ-1. Not familiar with that particular gadget? Well, you probably know its sound. GARCIA-NAVARRO: The fuzzy tone immortalized in this Rolling Stones song came from a guitar effects box invented by Nashville studio engineer Glenn Snoddy. And like many great inventions, Fuzz-Tone came about from a happy accident. In 1960, Snoddy was working with country singer Marty Robbins on the song "Don't Worry." MARTY ROBBINS: (Singing) Don't worry about me. GARCIA-NAVARRO: Turns out, there was a bad transformer in the console, and when it was time for the instrumental solo, the guitar issued a decidedly odd sound. GARCIA-NAVARRO: Snoddy was initially annoyed by the faulty equipment but was convinced by the artist and producer not to rerecord the session. It was a delightfully novel sound. By 1961, "Don't Worry" was topping the country charts, and guitarists wanted to know how to get the fuzz. Nancy Sinatra went to Snoddy asking for the secret sauce, but the magic transformer had died. So he invented a box with a button for guitarists to activate the fuzz tone. Gibson started manufacturing the FZ-1, and soon, other companies joined in the fuzz frenzy, marketing boxes with names like Tube Screamer, Big Muff and Fuzzrite. GARCIA-NAVARRO: ...The Guess Who's "American Woman" and on and on, all going back to an engineer working at a Nashville studio called the Quonset Hut. Glen Snoddy died in Murfreesboro, Tenn., on May 21 at the age of 96. ROBBINS: (Singing) It's all right. Don't worry about me. Transcript provided by NPR, Copyright NPR.